Are you dreaming up a ballerina decor for your little one? This baby girl nursery theme is popular because it brings to mind all that is delicate, elegant, soft and feminine. Once again, the colors of a ballerina bedding and room decor would imply pink and white or black. Of course, you can always add a splash of some other color, such as green, orange or even a darker pink. Plan on going the traditional way? There are actually wall paints that come with balerina names...such as Sweet Pink or Purple Tutu by Benjamin Moore. If you have your heart set on a balerina theme for the nursery, but do not want the traditional pink and white colors in the room, there are a number of options. Check out tutus – sky blues, lavenders, black and whites, you can find many different colors today. A tutu or a pair of ballerina slippers make a wonderful wall decor item for a room that spells ballerina decor. Find a favorite comforter – bedding set is a great way to find the colors for the nursery as they need to complement each other. To know how to use the colors of the comforter for the wall paint, check out our pages on Wall Colors. Tip: Remember, the comforter does NOT have to show ballerina's on it. Keep a neutral comforter and display the theme through wall décor and other accessories. If you have been searching for ballerina bedding, you would know that there are many decorating items with the ballerina theme to choose from. Do you need to buy them all? Of course not. You already know that. To build a theme, you can buy specific items, depending on your budget. So if you want to splurge on that super-cute Little Ballerina Bassinet or that splendid Ballerina Slippers Chandelier, go ahead. But remember to keep the number of such key themed items to no more than two or three. 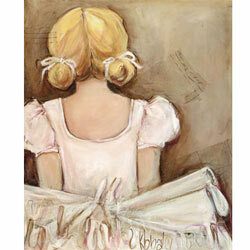 A ballerina bedding or ballerina paintings in the room are some obvious ways of showcasing your chosen theme. Why not use some subtle room decorating items to introduce your theme. We are talking about things like pale pink bow shaped knobs, ballerina bookends or Ballerina Toe Shoes Waste Basket. You can also place such figurines around the room or baby nursery, or display your daughter's ballet tutu or ballerina slippers on the wall. There are many wall decals and murals that can immediately become the focus of the room. You can also make one accent wall featuring a Ballerina Wallpaper. Here is another balerina bedroom decorating idea that you can incorporate into your room theme. Have you seen these very cute ballerina dessert plates? I love the pose and the colors. Instead of using it in the traditional way however, why not put them up on the wall - you could put hooks on the wall under each plate. If you don't like the look of a plate on the wall or if it is taking too much space, cut out the silhouette of the balerina and stick on wall with double sided tape. Don't let traditional thinking get in the way of your creativity. You can find inspiration anywhere.